Why Are We Still Talking about Randy Credico? And with the election done (and some big successes in MI), we resume our regularly scheduled Russian investigation. Yesterday, the WaPo reported that the two Stone associates who, it reported on October 21, claimed they could corroborate Roger Stone’s claim that Randy Credico was his go-between with WikiLeaks have testified to the grand jury. Chuck Ross had more details (first) about Nixon’s interaction with the FBI and Mueller’s team. I feel about this reporting the same way I feel about the Roger Stone stories generally: that virtually all of the reporting is missing the point of what Mueller is looking at. Indeed, the far more interesting detail in the WaPo report is that Jerome Corsi (who, remember, said that he avoided legal exposure with something related to Stone) has spent weeks chatting with Mueller’s team. As I’ve laid out here, Corsi spoke with Stone on what appears to be a critical day in August 2016, and then posted an attack on John Podesta that preceded, but seemed to anticipate, the release of his stolen emails in October 2016. So Corsi knows (or at least has non-falsifiable information about) the real story, whereas Credico still feels like a failed cover story for Stone. Which is why (as always) I’m more interested in the timeline of all this than what Lugo and Nixon had to say (and I agree with Credico’s attorney that their stories don’t actually refute what Credico has said). Jerome Corsi was first interviewed by Mueller’s team on September 6, in what he hoped would be an interview that staved off a grand jury appearance the next day, the same day as Credico’s appearance. Not only did the interview not satisfy Mueller, they called him back to the grand jury on September 21, and (according to Corsi) he has remained in close contact with Mueller’s team since — and he doesn’t seem that bothered by that. Meanwhile, when the WaPo initially reported that Lugo claimed he could undermine Credico’s claims that he was not Stone’s back channel, he had already testified, two days earlier on October 19 (meaning Mueller found him themselves, which makes sense because he communicated directly with Credico). But Mueller only contacted Nixon after the WaPo story — perhaps because his public comments eliminated any question that he would involve attorney-client privilege or perhaps because they didn’t know about him beforehand. He was interviewed on October 26, then testified before the grand jury November 2, last Friday. Nixon rather ostentatiously told the always credulous Ross that he offered up his willingness to Stone to go to the press about the November 2017 dinner. Which may be how and why WaPo learned about him and Lugo, as he attempts to undermine the story against him. Between the two of them, however, they show only that Credico referred to himself as the back channel in spring 2017 and then showed hesitancy — when he was being subpoenaed by the House to testify about just that issue — to be public identified as Stone’s source in November 2017. Yet Stone forced that issue by publicly IDing Credico as his source after he was subpoenaed. Stone’s story — his attribution to learning that Wikileaks had emails from Hillary’s server on July 25 and then vaguely his other WikiLeaks knowledge to Credico — still doesn’t explain his actions in August 2016. And that happens to be the area that Corsi does know about, and is surely one of the topics he has spent two months explaining to Mueller. Corsi, of course, during the same spring 2017 period when Credico was talking about being IDed as Stone’s source, offered up an explanation for Stone’s comments, an explanation that didn’t make sense at the time. Mueller is not interviewing witnesses to test Credico’s story about whether he really was Stone’s go-between. He’s interviewing witnesses to learn about Stone crafted a cover story that still makes no sense. 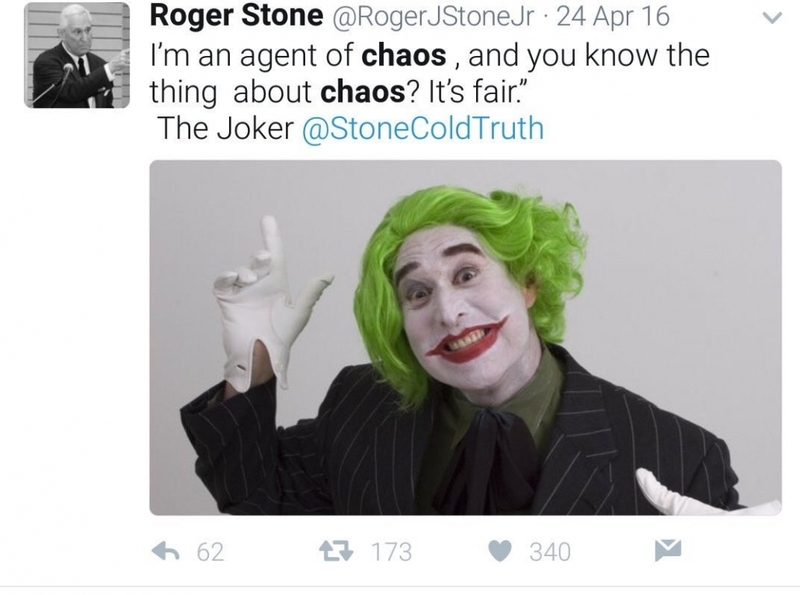 https://www.emptywheel.net/wp-content/uploads/2018/06/Stone-Agent-of-Chaos.jpg 797 1072 emptywheel https://www.emptywheel.net/wp-content/uploads/2016/07/Logo-Web.png emptywheel2018-11-07 11:57:002018-11-07 11:57:00Why Are We Still Talking about Randy Credico? I suspect Stone used Credico to meet someone close to Assange, and has turned around and tried to pin everything on Credico to cover for Assange’s cutout. They didn’t waste any time: Sessions resigns. Some more info about this on the other thread, here. Can Mueller talk to Sessions now, on obstruction, before the investigation is killed? Or, “resigns” at the request of Kaiser Quisling. EW’s tweet nails the financial side, but also understand there are two months for mischief with the current Congress, so look for a special session to kill off Social Security, Medicare, pass another tax cut and get some more judges consented before the pending subpoenas and inconvenient investigations make it politically hard to get anything through. Mueller’s investigation may just issue a report today, or if they get wind of a plot to shut them down. Does the new guy (Whitaker) have to be confirmed? He was Sessions’ Chief of Staff which I do not know is a Senate-confirmed post. If he must be confirmed, then Mueller has time to get the report into play due to the vetting process. If he is already confirmed by the Senate, things could move very quickly. I don’t recall this name being in play in the DOJ Kremlinology sessions (I’m sorry… not) earlier this year. Wonder what the deal was, what Kelly and Trump offered Sessions and his Senate colleagues to get rid of Sessions. Mind you, little Lindsey had demonstrated over the Kavanaugh hearings that he had joined Trump’s pack of hounds, so Trump might not have needed to offer much to get what he wanted. If he had any integrity, he would have refused to resign, forcing Trump to fire him. So you’re right, something in it for him. You referred to Sessions and used integrity in the same sentence. In Scrabble, that would be a high score. Elsewhere, it’s an oxymoron. Whitaker’s c.v. reads like a GOP-loyalist and hit man. Top college footballer. State university in Iowa for MBA and law school – no Harvard and Yaley for Trumpy. Former USA. Party loyalist and GOP enforcer. He was apparently the White House mole on Sessions’ staff and inside the DoJ, his status as the boss’s COS allowing him to stick his nose into any locker room, locker or shower. Trump bypasses and isolates Rosenstein, retaining the ability to fire him and have Mueller fired as publicly and humiliatingly as possible. Trump’s specialty. It will be attenuated slightly, owing to the new House majority’s ability to stick it’s nose into where it belongs. Whitaker went on record early to say that Mueller’s investigation “has gone too far”, etc. He will curtail or end it, if he can. As COS, his appointment would not have required Senate approval. As an acting AG, he would ordinarily need Senate approval to remain. A common tactic, one Kelly, who has experience with large organizations that Trump does not, would find familiar, is to appoint a placeholder to take names, clean house, and take the heat, then reassign him in favor of a longer-term replacement. That someone is not directly implicated in the the ripping out. As a bureaucratic unemployment practice, that tactic delays naming the permanent replacement. That allows a “leader” to demonstrate decisiveness, while buying time to decide on a long-term fix and for more theater. It buys time to assess the fallout from the house cleaning, which might affect which person you want for the more permanent replacement. As the scuttlebutt predicted, this was long in the works. Whitaker would have been part of the team that devised this plan, including whose career to end, and what to do next. an informative analysis. “long in the works” for sure. eoh – your last three paragraphs reek of likelihood. I didn’t know where else to put this, but I think the #ratfuckers category is as good of a place as any. He doesn’t make for interesting or intellectually honest political discourse, EVER.